BASOTEK, sustainable forest innovation. First collaborations in the value chain. One of the challenges facing the Department of Economic Development and Infrastructures of the Basque Government is the development of policies that guarantee a comprehensive response to the challenges and opportunities of the forest/wood value chain in the Basque Country. 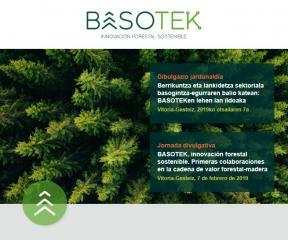 Within this framework, the Basque Government has organised a conference on 7 February in Vitoria-Gasteiz, under the title BASOTEK, sustainable forest innovation. First collaborations in the value chain. The aim of this event is to make known the multidisciplinary consortium of R+D+i, BASOTEK and some of its main lines of work: construction, green chemistry and industry 4.0, among others.